The R-PLEX Human PP Antibody Set includes a matched capture and detection antibody pair and calibrator for the quick and easy measurement of PP in biological samples. R-PLEX products leverage MSD’s electrochemiluminescence technology for better sensitivity and a larger dynamic range than traditional ELISAs. R-PLEX matched antibody sets enable the development of singleplex and multiplex immunoassays. Individual assays may be developed using MSD avidin- or streptavidin-coated plates. Custom multiplex assays with any combination of R-PLEX analytes, as well as R-PLEX plus U-PLEX analytes, can be developed on U-PLEX MULTI-SPOT plates. To learn more about the advantages of R-PLEX products click here. 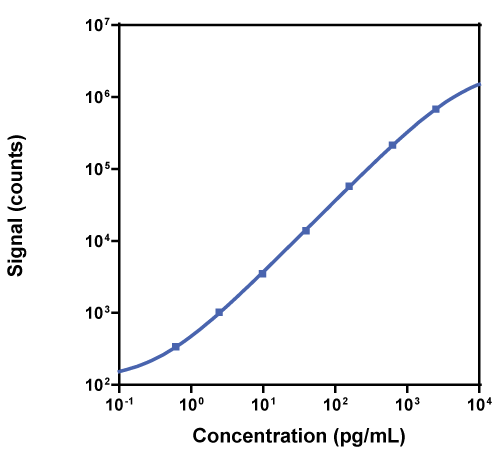 Calibration curve for the R-PLEX Human PP Antibody Set was assessed and representative data are presented below. Description - Pancreatic Polypeptide (PP, pancreatic prohormone, PPY) is produced by PP cells, which populate the Islets of Langerhans, and to a lesser extent, the pancreatic duct. PP consists of 36 amino acids and is similar to NPY and PYY, having high affinity for the Y4 receptor. It must be amidated at the C-terminus to possess complete activity. PP is secreted from the pancreas after a meal. Its actions are varied and are influenced by feedback from the CNS. PP often functions as an antagonist to cholecystokinin. Note: This antibody set also detects PP from non-human primate (NHP) samples.